As the commissioning authority for the 55th International Art Exhibition – La Biennale di Venezia in 2013, Joke Schauvliege, the Flemish Minister of the Environment, Nature and Culture, has announced that Ghent-based artist Berlinde De Bruyckere will represent Belgium at the 118-year old international event. In her comments about this commission, The Minister cited De Bruyckere’s profound commitment to exploring universal issues of the human condition, as well as the relationship of her art to the great continuum of history. Over the past three decades, De Bruyckere has created a consistent body of work that is still evolving and has the power to transform her participation in the Biennale into a lasting international presence. For the Belgian Pavilion in Venice, De Bruyckere has conceived a new site-specific installation that builds upon her existing oeuvre but derives its potency from connections to the historical context of Venice. She has invited acclaimed writer J.M. Coetzee, winner of the 2003 Nobel Prize for Literature, to serve as curator and artistic collaborator. De Bruyckere and Coetzee have followed one another’s work for years. Coetzee stated, “I have long admired the work of Berlinde De Bruyckere. More importantly, I have been touched (aangeraak) by her work in ways that are often obscure to me. I would not wish it otherwise. Her sculptures explore life and death – death in life, life in death, life before life, death before death – in the most intimate and most disturbing way. They bring illumination, but the illumination is as dark as it is profound”. 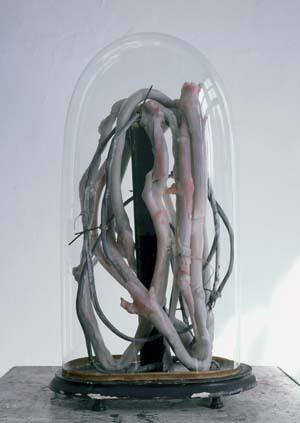 De Bruyckere has said that she sees in Coetzee “a kindred spirit” and senses in his work the all-devouring need to write about what she also feels in creating her sculptures. Coetzee will not perform the traditional task of an artistic curator, but will act as a source of inspiration and a partner in dialogue for De Bruyckere. “To discuss plans and projects with her, and if the gods are on our side, to guide and be guided by her in her explorations,” Coetzee explained. This unique collaboration in Venice is a logical extension of a joint project from 2012, when De Bruyckere and Coetzee published the book ‘Allen Vlees (All Flesh)’, combining her images with his writings. The artist selected key passages from Coetzee’s books and arranged them alongside photos of details from her sculptures. In this way, words are juxtaposed with images to suggest two parallel worlds that enrich but do not overtly illustrate each other. In addition to J.M. Coetzee, Berlinde De Bruyckere invited Philippe Van Cauteren, S.M.A.K. artistic director since 2006, to serve as the Belgian Pavilion co-curator. Under his directorship the museum has held major monographic exhibitions by Lois Weinberger, Kendell Geers, Paul McCarthy, Mark Manders, Dara Birnbaum, Jorge Macchi, Nedko Solakov, Joachim Koester, as well as artistic projects in public space like TRACK. Van Cauteren is currently organising a retrospective of the work of Berlinde De Bruyckere, which will be shown at S.M.A.K. in 2014 and at the Gemeentemuseum in The Hague (Netherlands). Berlinde De Bruyckere (Ghent, 1964) makes her sculptures in a personal, highly physical and expressive visual idiom. She delves deep into man’s omnipresent needs and fears. Elements such as vulnerability, mortality and solitude run through her oeuvre. She takes inspiration from literature and film history, but her sculptural work also displays a great affinity for such old masters as Lucas Cranach and Antonello da Messina. As Ovid wrote in his Metamorphoses, ‘My mind leads me to speak of figures changed into new bodies’. This is a challenge that Berlinde De Bruyckere has also taken up. In her work, mutilation and suspected violence assume extreme forms; they will always be related to the possibility of transfiguration and growth. Switzerland in 2011; and a solo exhibition at (DHC / ART Foundation for Contemporary Art, Montreal, Canada in 2011. De Bruyckere’s exhibition, ‘In the Flesh’ is currently on view at Kunsthaus Graz and the St Dominikus Chapel in Graz (Austria). The official catalogue of the 2013 Belgian Pavilion will be published by Mercatorfonds. As with her previous publications, Berlinde De Bruyckere will create an artist’s book rather than a traditional exhibition catalogue. It will include essays by J.M. Coetzee; Philippe Van Cauteren; Herman Parret, Professor Emeritus at the Higher Institute of Philosophy at Leuven University (Belgium); and Berlinde De Bruyckere. Photographs will be included by Mirjam Devriendt.